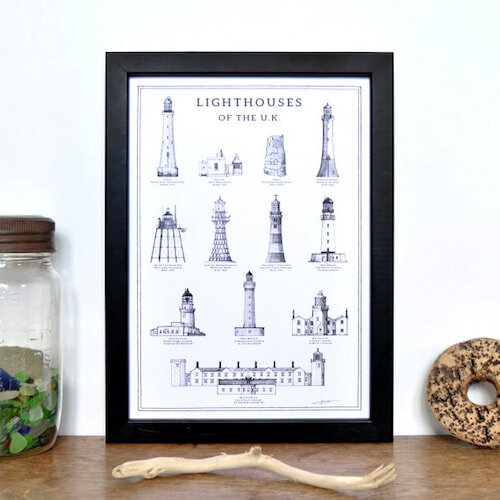 The U.K.’s craggy coastline is peppered with lighthouses. Built in some of the most inhospitable places imaginable, these iconic buildings have protected mariners for centuries and evoke a sense steadfastness and nautical adventure like nothing else. This A4 info chart shows some of the most important, from the tallest to the shortest and from the oldest to the most iconic. Individually signed and printed on 250gsm card stock. A4 size (29.7x 42cm) - fits a standard A4 frame. Supplied unframed & wrapped in a clear cello sleeve with a thick backing board.